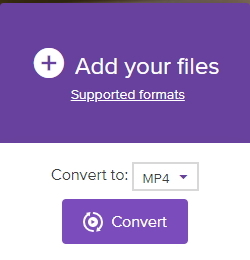 Convert MOV to MP4 easily and other 150+ video & audio formats. Is there any free way to convert MOV to MP4? People are looking for a free MOV to MP4 converter for further use. But it can be very challenging when converting MOV to MP4 especially if you are unable to secure the converter for Mac and Windows. Well that should not be a problem for you anymore. Why? This article shares the best 8 Free MOV to MP4 converters, with introduction and using guide. You are free to pick out the best one to meet your requirements among the following video converter. Now let's start with the best MOV to MP4 converter, iSkysoft Video Converter Ultimate. Convert MOV to MP4, AVI, MKV, WMV and 150+ video/audio formats. Edit the video using its inbuilt editing features like split, merge, crop, add saturation and brightness to the videos. Transfer your converted video or music songs to your mobile devices with USB connected. Offer a set of tools like GIF maker, VR converter, screen recorder, etc. Download online videos from over 1,000 popular sites, like YouTube, Facebook, VEVO and more. Burn your videos to DVD or copy DVD file as a backup. Before getting started, you can watch the video tutorial first to have a rough idea of how to covnert MOV to MP4 on Mac. Note the Windows version functions almost the same. 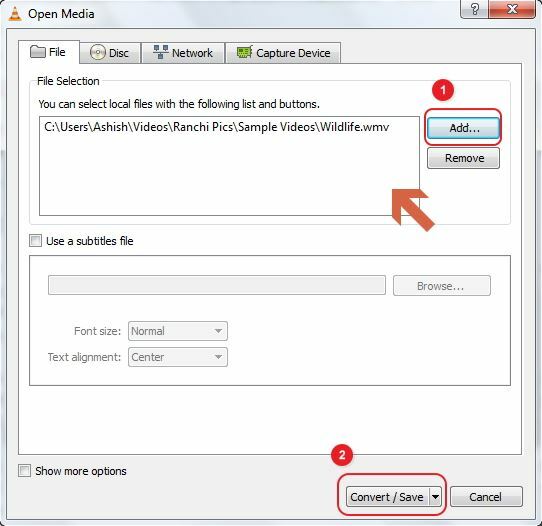 Drag and drop your MOV videos to the converter or click the Add Files button on top left to load MOV files from your computer. Hit beside Convert all tasks to: to get the format tray, go to Video tab and select MP4 as output format. Tips: If you want to adjust the encode settings like frame rate, bitrate of the MOV video, just click to get the video editing windows. Or you could simply choose the output qulity performance and the resolution in the right. Go back to the main window and click the Convert or Convert All button to start to convert MOV to MP4 on your Mac or Windows. As you may know, there're countless online MOV to MP4 converters allowing you to free convert MOV to MP4 online. To save your time, we pick up the No.1 MOV to MP4 freeware online for your reference - Media.io, which converts MOV to MP4, AVI, WMV, MKV, MP3, WAV and most opular video/audio formats. Step 1. Click + to upload MOV file to the free MOV to MP4 converter online. Step 2. Select MP4 beside Convert to: to change MOV to MP4 free. Step 3. 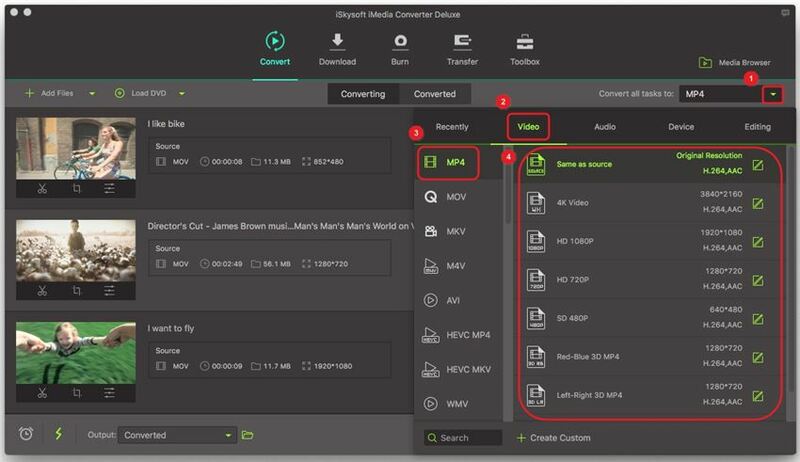 Hit Convert to start convert MOV to MP4 free online. Known as one of the most popular media player, VLC might surprise you by its hiding ability to free convert MOV to MP4, MKV, AVI and many other media file formats. Without further ado, let's get started by following the step-by-step tutorial on free MOV to MP4 conversion. Step 1. Download and install VLC media player on your computer first, open it and go to Media > Convert / Save... to get the primary window for free MOV to MP4 conversion. Step 2. Click Add... or directly drag and drop your desired MOV file to VLC. After that, click Convert/Save in the bottom to enter the Convert window. Step 3. Choose Video - H.265 + (MP3) MP4 from the Settings box and click Browse to specify the Destination to save the converted .mp4 files. 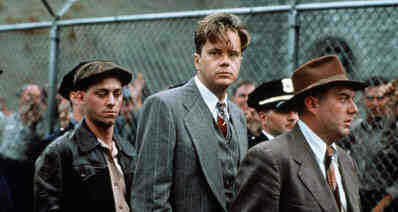 When everything is set, just hit Start to free convert MOV to MP4 in VLC. 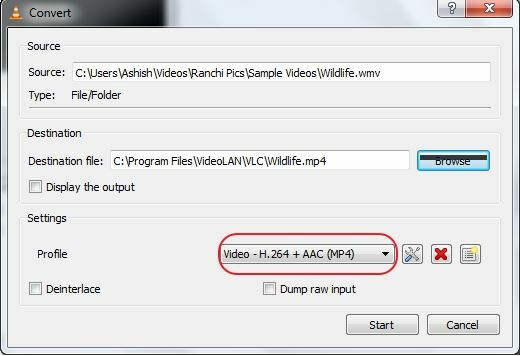 Tips: If you're Mac users, please move to VLC Convert MOV to MP4 Mac for detailed instructions. We also recommend Handbrake as a flexible free MOV to MP4 converter Mac/Windows/Linux available. Although its interface is a little complex, the step-by-step tutorial will make it easy and clear to follow. Step 1. Run the program’s icon on your computer and set the default path when prompted. Step 2. 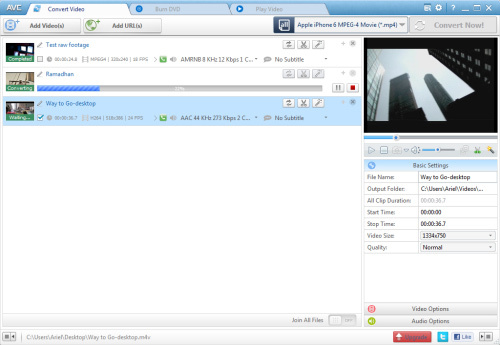 At the top of the program’s window, select Source and choose the Video File option from the drop-down list. Search for the MOV file to be converted, select and click Open. 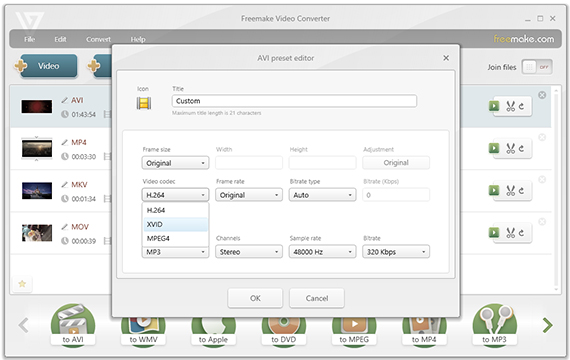 HandBrake offers many presets, which you can choose depending on your device. The file selected shall be listed under the Source heading. Step 3. Go to the Container setting and select the MP4 format from the drop-down list. Within this same window, click on Browse. Choose the destination for your output file and supply a suitable name for this file. Save the file in the same location as the Source and then click Save. Step 4. Go back to the HandBrake’s and click the Start button. The process would begin and the progress visible at the bottom of the window. Freemake is another free MOV to MP4 converter you can't miss, its well-designed interface makes MOV to MP4 no longer a tricky process. Step 1. Locate and click the +Video button to enable you add the videos you would like to convert to MP4 format. Alternatively, you can drag-and-drop the respective MOV videos from the source to the primary interface. You can add as many videos as you want. Step 2. On the program’s interface, click the to MP4 option. This is the output format for your uploaded videos. Once this is done, select a preset. You can choose to use one of the ready presets or create a custom preset. However, we recommend the Same as Source preset. Step 3. Locate and click the button labelled Convert to start converting MOV to MP4. Once this button is selected, the download process would automatically commence. You can monitor the progress on the status bar. 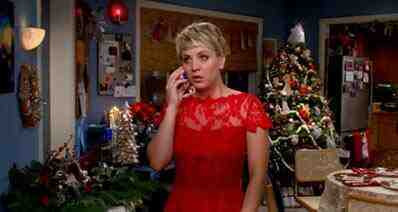 The program will notify when the process successfully complete. This is a very effective converter for MOV to MP4 and its available for free. Choose to have a free trial before deciding to have it for your use. The editing features that this program comes with are very powerful to make editing easy. That is complemented by high conversion speeds and assured quality for the converted video. Standout features are sorted profile settings, adjustable aspect ratio, bitrate calculator and snapshot option. Pros: This is one of the few converters that have advanced technology for video editing to allow you split and customize through adjusting key video parameters. Cons: It can only be compatible with a few video formats. It's very versatile to allow for any kind of editing that you wish for. You will be provided with unlimited options for converting both video and audio while Windows is the main platform it supports. Its availability as a free version adds to its benefits that you will enjoy once you have chosen it for all your video editing tasks. This is an all-in-one convertor for video so you must get the best out of it. You can download video files from many sites, edit as you may like and then playback on different platforms and portable devices. Pros: It works in very high speeds, has guarantee for high quality to converted files and allows for batch conversion of many files at a go. Cons: It takes a long time to load videos. 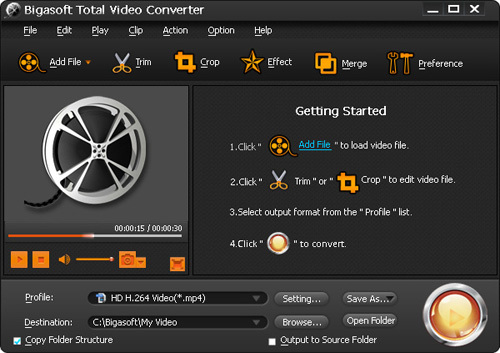 When converting MOV to MP4 with this program, you will be able to do many things at the same time; create DVD with menu, rip DVD to all formats, convert over 250 video and audio formats, remove DRM protection, download videos from over a thousand sites, play any video and audio, edit and touch up video as well as fetch and embed video metadata. Pros: The conversion speeds of 30X faster will save you fidelity and time since video encoding and decoding are accelerated to a speed you will like. With such speeds, you will be able to enjoy smooth playback, prompt conversion for SD and HD while quality will always be something that you are guaranteed. Cons: There is some limitations into batch conversion through this software. MP4 is among the many formats that are supported by this program to make video editing fun-filled and professional. It comes with stability and comprehensiveness of features which as an editor you will be happy with. You can accomplish many editing tasks like trimming, cropping, merging and adding subtitle to your video with this program. Furthermore, you will be at ease to make adjustments to the settings of your video. Pros: The intuitive interface is one of the features that stand out from this software because it makes editing very easy. Cons: Missing the batch conversion feature. You need to know about the features of this program to understand why it is the darling of many people who are into video editing business. It can convert across very many popular formats for both video and audio, it can extract audio from video file, it can download and then convert videos with ease and has super-fast speeds for conversion. The biggest advantage of using the program is batch conversion because it will allow you to handle as many files as possible at a go. That will definitely save you time that can be consumed when converting files individually. Ease of use is another benefit to draw from this program and that is because of the user-friendly interface. Pros: Ease of use and user-friendly interface. Cons: Lack of customer support, and it doesn't include many of the editing tools that you might expect to see.